A fluorometric turn-on assay is described for ascorbic acid (AA). It is based on the controlled release of polyallylamine-stabilized gold nanoclusters (polyallylamine-AuNCs) from MnO2 nanosheets. In an aqueous solution of near-neutral pH value, the positively charged capped AuNCs are adsorbed on the surface of the negatively charged MnO2 nanosheets. The adsorption leads to the quenching of the fluorescence of the AuNCs. However, in the presence of AA, MnO2 is reduced to Mn2+. This causes the destruction of the MnO2 nanosheets. As a result, the fluorescence of the polyallylamine-AuNCs at 615 nm is recovered. This method for determination of AA is inexpensive, sensitive, and selective. It works in the 0.01 to 200 μM concentration range and has a 3.2 nM detection limit (for S/N = 3). Gold nanoclusters (AuNCs) and polyallylamine can form polyallylamine-AuNCs to enhance the orange fluorescence of AuNCs. 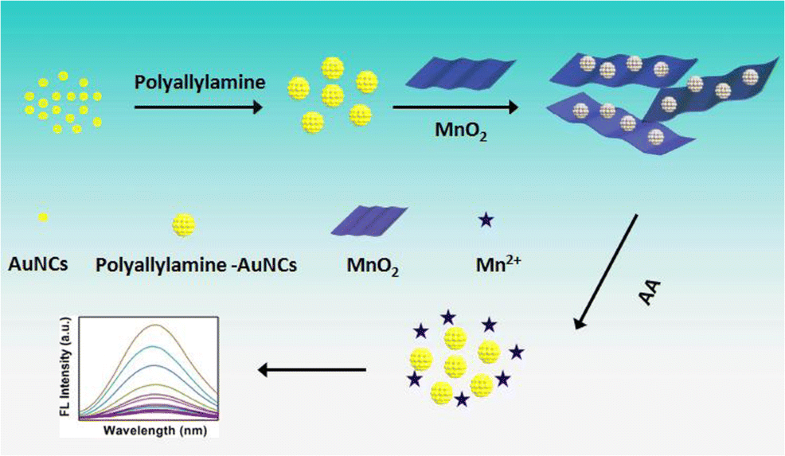 MnO2 nanosheets can absorb polyallylamine-AuNCs, and this results in fluorescence quenching of polyallylamine-AuNCs. Ascorbic acid (AA) can reduce MnO2 nanosheets, in this results in the fluorescence recovery of polyallylamine-AuNCs. 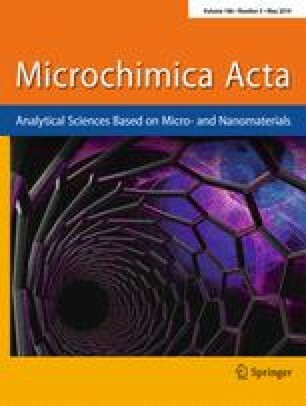 The authors are grateful for the support of the National Natural Science Foundation of China (21775089), Outstanding Youth Foundation of Shandong Province (ZR2017JL010), Key Research and Development Program of Jining City (2018ZDGH032), and Project of Shandong Province Higher Educational Science and Technology Program (J18KA101).